Is it ok to drink a little? Linger? Is asking to taste "the good stuff" acceptable? Should you buy a bottle? Three tasting room pros share their advice. Recently, a friend of mine who just started to get into wine asked me about tasting room etiquette. Is it mandatory to buy bottles? It is appropriate to tip? How does she ask for “the good stuff”? I quickly realized that while the tasting room experience is commonplace for those of us who’ve lived in wine country for years and visit wineries often, it remains foreign territory for millions of non-industry Americans. When answering my friend, I also realized that some of my advice may actually be out of date, especially since many tasting rooms now function as de facto wine bars. So, should you tip? I wasn’t sure, nor had I been tracking whether the rules I’ve been following for about 15 years still have any validity. Were things getting more relaxed with the millennial crowd? Should we be spitting? Can I finally wear perfume? • and Andrew Jones, whose Field Recordings tasting room in the “Tin City” urban winemaking collective in southern Paso Robles caters to a creative and often millennial crowd. Don’t wear fragrance. There go my cologne dreams! Seems obvious, but scents can ruin the tasting experience for everyone within nose-shot. Be open-minded: Drop pre-conceived preferences. “Maybe you’ve never tasted a rosé you’ve liked, but go ahead and try what is being offered,” says Margerum. “I have folks say that they do not like sweet wines at all, but my ‘dryish’ Gewürztraminer turns out to be their favorite of the wines poured!” adds Schaffer. Don’t pretend to be in the industry. “Industry” truly means those working to make a living within the wine trade, so don’t fake it just to get a discount or special treatment, even if you are truly passionate. “We seriously have home winemakers come in with fold ‘n’ tear business cards they made at home and ask for discounts,” says Jones. And if you are industry, act like it. “If you are industry, and it’s a busy Saturday, don’t ask for special treatment when we have a full bar,” says Jones. Don’t ask for the “good stuff.” Definitely don’t, but it’s okay to inquire whether there are any library or reserve wines open beyond the advertised flight. Just realize that special requests should increase your pressure to purchase wine. Linger, but meaningfully. 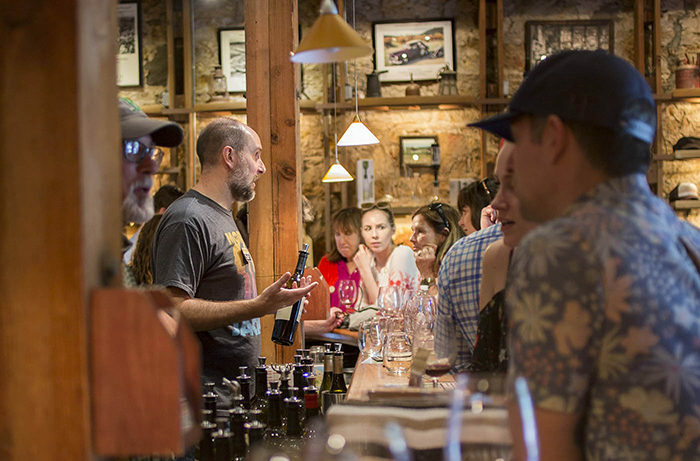 Both Schaffer and Margerum happily allow people to retry wines if they are considering a purchase, so long as patrons aren’t getting drunk or disrupting the experience for others. Jones thinks lingering is more the fault of the winery than the taster. “If you format things right, it isn’t an issue,” he says. Tips? Depends. Jones doesn’t take tips. “It’s a tasting room, not a bar,” he says. But Margerum and Schaffer are both open to tipping.